Basic Mathematical Concepts (T. Gajewski). 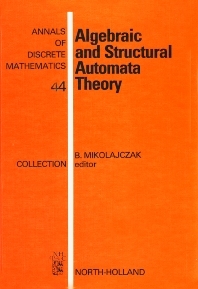 Automata and Languages (J. Stoklosa). Finite Automata (L. Beyga). Minimization of Automata (B. Mikolajczak). Input Subautomata (J. Bergandy, Z. Miadowicz). Automata Homomorphisms (B. Mikolajczak). Realizations of Automata: State Assignments (P. Siwak). Realizations of Automata: Structures of Nets (P. Siwak). Time-Varying Automata (T. Gajewski). Transforms and Extensions of Automata (L. Beyga). Periodic Sums of Automata (Z. Miadowicz). Linear Automata (J. Stoklosa). Bibliography. Index. Automata Theory is part of computability theory which covers problems in computer systems, software, activity of nervous systems (neural networks), and processes of live organisms development. The result of over ten years of research, this book presents work in the following areas of Automata Theory: automata morphisms, time-varying automata, automata realizations and relationships between automata and semigroups. Aimed at those working in discrete mathematics and computer science, parts of the book are suitable for use in graduate courses in computer science, electronics, telecommunications, and control engineering. It is assumed that the reader is familiar with the basic concepts of algebra and graph theory.